Endothelium-dependent flow mediated dilation (FMD) and pulse-wave velocity (PWV), are used as measures of vascular health and predictors of cardiovascular risk in clinical studies, and both are age-dependent. Numbers of circulating endothelial microparticles (EMPs) and endothelial progenitor cells (EPCs) are also associated with cardiovascular risk, but independent of age in humans. The use of these measurements for pre-clinical assessment of drug cardiovascular safety and efficacy in non-human primates (NHPs) may promote the translation of drug-induced effects on vascular function to clinic outcomes. However, in NHPs, the age effects on the non-invasive measurements of FMD and PWV and the relationship of EMPs/EPCs with FMD are unknown. A non-invasive, clinically-relevant approach to assess FMD and PWV was used to examine their relationship with age and with EMPs/EPCs in NHPs. 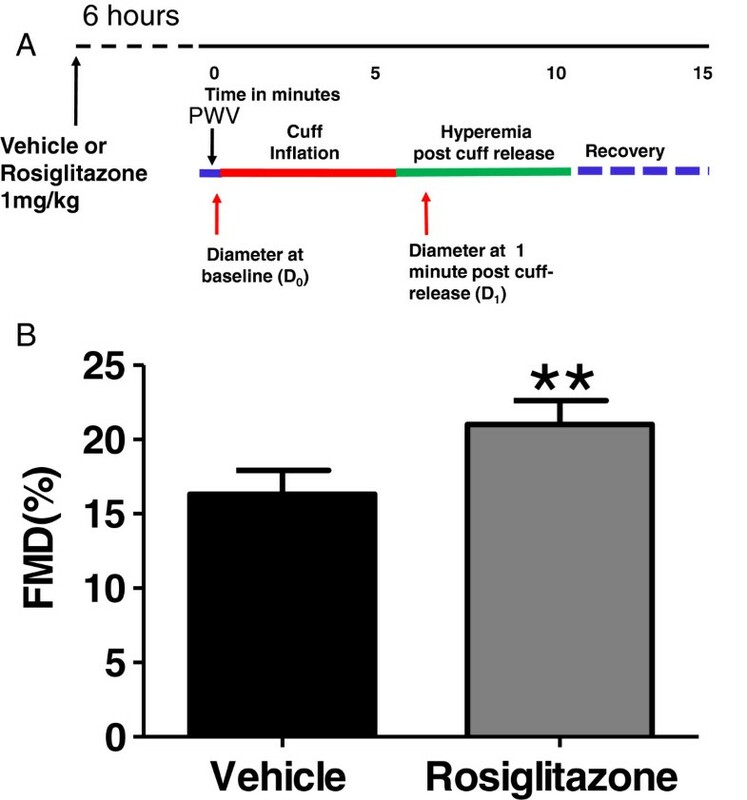 The effects on FMD of nicotine and rosiglitazone were evaluated in senescent primates in an effort to validate our FMD method for pre-clinical assessment of vascular function. FMD and PWV methods were established in a colony (n = 25) of metabolically healthy, cynomolgus monkeys ranging in age from 6 to 26 years. 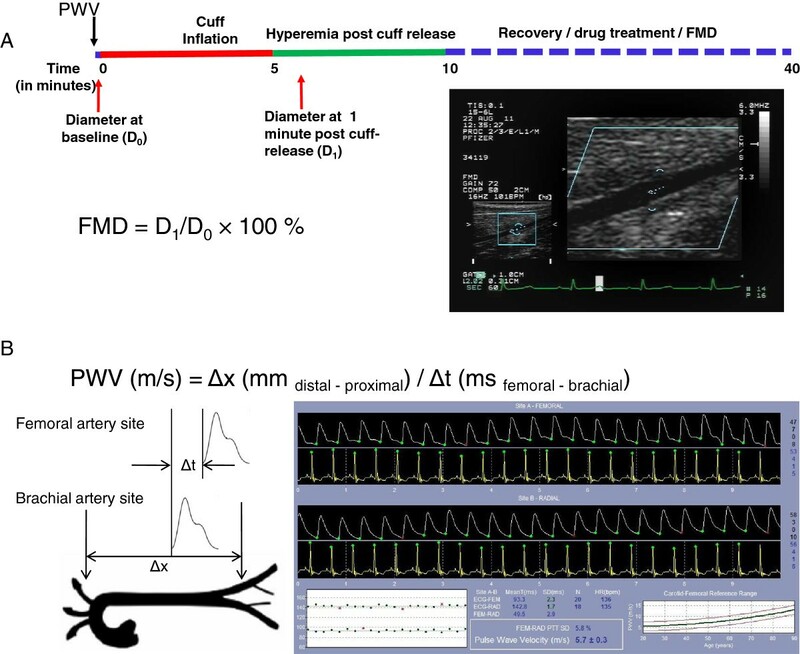 FMD, defined as the percent change, at 1 min of cuff release, from baseline vascular diameter (0.15 ± 0.03 cm), had a strong, negative correlation with age (r = -0.892, p < 0.0001), ranging from 6% to 33%. PWV positively correlated with age (r = 0.622, p < 0.002) in the same healthy monkeys. Nicotine and rosiglitazone, were evaluated in subsets of senescent primates (mean age 16.3 ± 1.5[SEM] years). Rosiglitazone significantly improved FMD (21.0 ± 1.6% vs. vehicle 16.3 ± 1.6%, p < 0.01) without changing baseline diameters, and coincided with a significant increase in circulating numbers of endothelial progenitor cells (CD45-CD31 + CD34 + VEGFR2+ 7.1 ± 1.3 vs. 4.8 ± 1.1 counts/μl) and a decrease in endothelial microparticles (CD45-CD42a-CD54+ 26.7 ± 11.1 vs. 62.2 ± 9.8 counts/μl)(p < 0.05). Conversely, FMD was significantly reduced with nicotine (8.7 ± 1.4% vs. vehicle 20.1 ± 2.2%, p < 0.05). Adult NHPs demonstrate the characteristic linear relationship between age and vascular function using the non-invasive clinically-related measurements of FMD and PWV. However, numbers of circulating EMPs and EPCs did not correlate with age. Endothelial function assessed with FMD, together with EMPs/EPCs assessment, may serve as a novel approach for translational research and therapeutic discovery. Age should be considered in the study design or data analyses when FMD or PWV is used in NHPs. Clinically, vascular function may be evaluated non-invasively by measuring flow mediated vascular dilation (FMD) , which assesses endothelial function as arterial vasodilation induced by an increase in luminal blood flow, and pulse wave velocity (PWV), which measures arterial stiffness as the velocity of pressure pulse waves through the aorta . Both endothelial dysfunction and aortic stiffness are associated with diseases and conventional cardiovascular risk factors [1–6]. FMD and PWV are also predictors of cardiovascular events in humans [7, 8]. Aging is associated with both functional and structural changes in the vasculature , and leads to impaired FMD  and increased PWV [3, 10]. When assessing vascular function during interventional drug trials [11, 12], age is a classic confounding factor. Non-human primate (NHP) is an important translational preclinical model for cardiovascular disease, diabetes and other metabolic diseases [13–16] and like humans can naturally develop glucose intolerance and diabetes without pharmacological or surgical inducement [16, 17]. FMD and PWV have been used to evaluate test drugs and disease effects [16, 18] in NHPs. However, the age effects on these measures of vascular function (FMD and PWV), which are well-documented in humans, remain unaddressed in NHPs. Since NHP can live as adults for decades, a better understanding of the relationship between age and FMD/PWV would be important in order to avoid the confounding effects of age when interpreting FMD and PWV . Thus, our primary goal was to develop the methods to measure FMD and PWV in NHPs and to examine the effects of age on these clinically relevant assessments of vascular function. In addition, we explored using FMD in senescent NHPs as a translational approach to cardiovascular efficacy/safety assessment. Here, we focus on FMD because there is limited information on using PWV for clinical assessment of drug effects, and FMD has emerged as an important clinical measurement for assessing cardiovascular risk factors and disease therapies [5, 11, 19]. For example, chronic treatment with rosiglitazone improve FMD from ~5% to ~7% in patients with type 2 diabetes mellitus . To make the efficacy/safety assessment, rosiglitazone, which targets PPARγ nuclear receptor, was used to show beneficial vascular effects, and nicotine was used to mimic the well-known detrimental effects of smoking on FMD. Finally, endothelial microparticles (EMPs, membrane coated vesicles) and endothelial progenitor cells (EPCs, a population of cells in the blood involved in endothelial repair), are associated with cardiovascular risk in humans [20, 21] and are being investigated as clinical biomarkers of endothelial vascular health. Here, we have a unique opportunity to examine the relationship of EPCs/EMPs with age and FMD by addressing these “clinically relevant” biomarkers in our primate model. Since PPARγ improves endothelial functions [22, 23] and increases the numbers of EPCs [24, 25], we determined the effects of rosiglitazone on circulating EMPs and EPCs, as well as, FMD in NHPs. Studies were conducted with the approval of the Pfizer Institutional Animal Care and Use Committee. Twenty-five healthy monkeys (Macaca fascicularis, also known as cynomolgus) (aged at 6 to 26 years, 18 males and 7 females) were studied. These monkeys were paired housed, when appropriate, in a room with temperature of 19-25°C, humidity of 30-70%, and 12:45/11:15 light/dark cycles with a 45 minute ramping period to full lights on/off as simulated dawn/dusk. The monkeys were fed a primate chow diet (PMI Certified Hi Fiber Primate Diet, LabDiet 5K91, PMI Nutrition International, St. Louis, MO) supplemented with fruits and/or vegetables with the amount adjusted to maintain a normal body weight. Conscious primates, previously conditioned to chair restraint (Plas-Labs, Inc. Lansing, MI), were seated comfortably in a primate chair for drug administration and blood collection prior to vascular measurements. We established clinically-relevant, non-invasive methods to examine FMD and PWV in non-human primates (Figure 1). FMD and PWV were measured between 9 am to 12:30 pm on overnight fasted monkeys. Monkeys were sedated with butorphanol (0.3 mg/kg, im) and midazolam (0.5 mg/kg, im), or with ketamine (5 mg/kg, im) + midazolam (0.35 mg/kg, im), placed on a 37°C heating pad to maintain body temperature, oriented in a right lateral recumbent position to allow access the right brachial and femoral arteries. Stable mean arterial blood pressure and heart rate during these procedures averaged 79 mmHg and 142 beats/min, respectively. Noninvasive assessments of vascular function in nonhuman primates(NHPs). A: FMD measurement in NHPs. A study protocol diagram is shown in panel A. Primates were sedated, and PWV was measured first, followed by baseline femoral diameter measurement (D0). Following a 5-min ischemia, the reactive hyperemia response was triggered by cuff release, and vessel diameter was measured at 1 min of the hyperemia response (D1). Following a recovery from 1st FMD determination, additional drug treatment and 2nd FMD measurement may apply if needed, and this is typically achieved within 40 min. FMD is calculated as percentage change of D1 from D0. An ultrasonographic picture is shown that depicts a femoral artery. B: PWV measurement in NHPs. Pulse waves from the right brachial and femoral arteries, as depicted, were collected. PWV was calculated as the Distance/Time using the equation shown, which is based on distance difference (Δx) between the two detection sites (femoral artery and brachial artery) and Δt, the difference in time lapse of a pressure wave gated to the corresponding ECG R-wave at the two detection sites (B left panel). A window of PWV recording by SphygmoCor program is shown (B right panel). See Method part for detailed description. Electrocardiography (ECG) electrodes were placed, to collect a lead II ECG signal. Pulse waves from the brachial and femoral arteries, were recorded using a SphygmoCor (AtCor, Itasca, IL) PWV probe that was associated with a modified SphygmoCor program (CvMSV9; modified for high rates). Distal-proximal distances were measured and entered into the program. PWV was calculated by the program using the equation PWV = Δx/Δt, where Δx is difference in distance between the two sites relative to the sternal notch, and Δt is the time for the wave to travel that distance (the difference in time lapse from R-wave peak to pressure wave peak, between the two sites). A minimum of 2 measurements were used to calculate average PWV. Brachial artery measurements were taken at the axilla and femoral artery measurements were taken mid-thigh for PWV. The average distal distance (femoral to notch) was 338 ± 5.4 mm and average proximal distance (brachial to notch) was 75 ± 3.1 mm (n = 25). The distal vs. proximal distance allowed sufficient difference to calculate the PWV. Average detection variation for PWV was 10.6%. FMD in the NHPs was measured using ultrasonography, as illustrated in the Figure 1A. The right leg was positioned and gently restrained to prevent movement during the study. An infant V-Lok cuff (WA Baum, Copiague, NY) was then placed below the knee and connected to a manometer. After applying ultrasonic gel, a linear array probe (6–15 MHz), connected to a Hewlett Packard Sonos® 5500 and mounted on an articulated arm (PPM100, Tektronix, Inc. Beaverton, OR), was positioned over the femoral artery, manipulated until a clear signal was obtained and then locked in place for the remainder of the protocol. Once a baseline recording of the femoral artery was collected, the cuff was inflated within 2 s to a super-systolic pressure (290-300 mmHg). After 5 min the cuff pressure was rapidly released (<1 sec.) and a second recording was collected at 1 minute of reperfusion approximating the time of maximal flow mediated dilation . Vessel diameter was measured, using electronic calipers, for baseline and 1 minute recordings. The average baseline femoral artery diameter for the study colony was 0.151 ± 0.03 cm (n = 25). Flow mediated dilation was calculated as the% change from baseline diameter. Each diameter measurement was the average of 4 segmental measurements taken ~1 mm apart gated to the ECG T wave. At the end of the experiment, monkeys were recovered by naloxone (0.05 mg/kg im and 0.05 mg/kg iv – if they received butorphanol) and flumazenil (2 mL per monkey, iv). FMD conducted 15 min apart showed average variation <5.5%. Six fasted monkeys (17 ± 1 years of age) were treated orally with both vehicle and rosiglitazone (1 mg/kg, coated on one PrimaTreat; Bio-Serv, Frenchtown, NJ) ≥2 weeks apart in a 2 × 2 crossover design (2 in vehicle-drug sequence and 4 in drug-vehicle sequence). Drug or vehicle was administered at 6:00 AM, and, FMD and PWV were measured ~ six hours later, a time point that showed increased FMD in a human study . Blood samples were collected (via cephalic vein) just prior to sedation, and immediately processed for determination of endothelial microparticle, endothelial progenitor cell and TNFα (detailed in following methods). These treatments were repeated in the same animals to determine the effect of rosiglitazone on lipids and intravenous glucose tolerance test. A separate group of monkeys (n = 3, 15 ± 4 years of age) were sedated, and intravenously infused with saline vehicle, then with 0.844 μg/kg/min nicotine bitartrate (Sigma Aldrich, St. Louis, MO), at rate of 0.4 mL/min. FMD was recorded at 5 min of vehicle infusion, and at 15 min of nicotine infusion (while the nicotine infusion was constantly maintained), and the study was completed within 35 min. The nicotine dose used was calculated to approximate the predicted blood nicotine concentration (40 nM) of a human study in which chewing nicotine gum reduced FMD [26, 27]. To measure EPC, whole blood was collected into EDTA tubes from animals fasted overnight and, incubated with anti-human CD34, CD31, CD45 (Becton Dickinson and Co./BD, Franklin Lakes, NJ) and VEGFR2 (R&D Systems; Minneapolis, MN.) antibodies. After lysing the red blood cells, the samples were analyzed using a high performance Canto II flow cytometer (BD) with DIVA software (BD). At the same time, whole blood was collected in sodium citrate tubes and platelet poor plasma (PPP) was prepared to measure EMPs. An aliquot of PPP was added to each of the two panels of antibodies: Panel 1 [CD42a-APC (conjugated in house), CD31-FITC, CD45-AF700, Annexin V-V450, CD105-PerCP (BD), CD54-PE (Invitrogen)]; Panel 2 [CD42a-APC (conjugated in house), CD31-FITC, CD45-AF700, CD106-PE-Cy7 (conjugated in house), CD62E-PE (BD), VEGFR2-PerCP (R&D Systems), CD144-Pacific Blue (conjugated in house) (BioLegend, San Diego, CA.)]. Cytofix was then added and a 500 uL aliquot was transferred into a Trucount tube (BD) and analyzed by flow cytometry. Venous blood samples were collected in serum separator tubes from untreated, rosiglitazone treated or vehicle treated monkeys fasted overnight, centrifuged at 3000 rpm for 10 min at 4°C, and levels of lipids and glucose measured on Siemens Advia 2400 chemistry analyzer, and levels of insulin measured on the Siemens Centaur Immunoassay, with kits of Advia Chemistry Systems (Siemens Healthcare Diagnostics Inc., Tarrytown, NY). Lipopolysaccharide (LPS, Sigma-Aldrich) stimulated release of TNFα was carried out, ex vivo, using sodium heparin anti-clotted whole blood that was harvested 6 hours after rosiglitazone dosing. Blood was stimulated with 10 ng/mL LPS for six hours with gentle rocking, plasma separated by 14,000 rpm centrifugation for 20 min at 10-15°C, and TNFα measured by using Linco Luminex®mouse cytokine assay(EMD Millipore, Billerica, MA). Monkeys fasted overnight were sedated with ketamine for duration of IVGTT. Two iv catheters were placed for blood sampling and glucose administration, respectively. Baseline samples were drawn starting approximately 10 min after initial ketamine dose and catheter placement. A 50% dextrose solution was then administered, iv, at 250 mg/kg over 20 s. Blood samples (~1 mL) for glucose and insulin analysis were collected in serum tubes at 2, 5, 7, 10, 15, 20 and 30 min post dextrose administration, centrifuged and the resulting serum analyzed for glucose/insulin levels. The Area Under the Curve (AUC) for plasma glucose and insulin levels from 0 to 30 min was calculated. Glucose disappearance rate was expressed as Kglc, the reduction of the loge of plasma glucose levels between 5 & 20 min following iv glucose administration and calculated using the formula: Kglc = (logeG1 – logeG2)/(t2 – t1) where G1 and G2 are the glucose levels at time 5 min (t1) and 20 min (t2) . Pearson correlation coefficient was computed for correlation study. Linear regression models were applied to investigate the relationships of age with FMD and PWV and the relationship between FMD and PWV. In order to evaluate the treatment effect of rosiglitazone on the endpoints of interest (FMD and PWV) compared to vehicle, a linear mixed effect model was applied to analyze each of the two endpoints from this 2 × 2 crossover study with age adjustment. Specifically, the model has treatment (drug vs. vehicle), sequence (1 vs. 2), and period (1 vs. 2) as fixed effects, age as a covariate, and subject (monkey) as random effect. Paired t test was used to compare EMPs/EPCs pre- and post- rosiglitazone treatment. Paired t test was applied to analyze the FMD data measured in the nicotine infusion study to evaluate the effect of nicotine on FMD compared to saline vehicle. Results are presented as parameter estimate (Mean) ± SEM. A two-sided p < 0.05 was considered statistically significant. To examine age effects on FMD and PWV in NHPs, we established clinically-relevant, non-invasive methods (Figure 1). FMD was measured in a colony of metabolically healthy monkeys (n = 25) with age ranging from 6-26 years. Serum levels of lipids (total cholesterol, HDL, LDL, and triglycerides; Additional file 1: Table S1A) showed no indication of hyperlipidemia, and levels of blood urea nitrogen and creatinine were normal indicating normal renal function. Since cynomolgus monkeys can naturally become glucose intolerant the primates were assessed using an IVGTT. Fasted blood glucose levels were normal and the areas under the curve for glucose and the disappearance of glucose in response to dextrose challenge were also normal, indicating no glucose intolerance in these monkeys (Additional file 1: Table S1B). In these metabolically healthy monkeys, FMD demonstrated a robust dynamic range (6 to 33%) that correlated negatively with age (r = -0.892, p < 0.0001; regression equation: y(%FMD) = -1.119x(year) + 36.00) (Figure 2A). These data indicate that age has a significant impact on FMD in NHPs. In the same monkeys, PWV ranged from 3 to 7 m/s, and also correlated with age (r = 0.622, p < 0.002; regression equation: y(PWV) = 0.0917x(year) + 3.276) (Figure 2B). The reduction in FMD also correlated with increase in PWV(r = -0.584, p < 0.002) (Figure 2C). However, unlike FMD and PWV, age did not significantly correlate with numbers of EPCs or subsets of EMPs in these monkeys (Additional file 2: Table S2). Age correlates to FMD and PWV in NHPs. 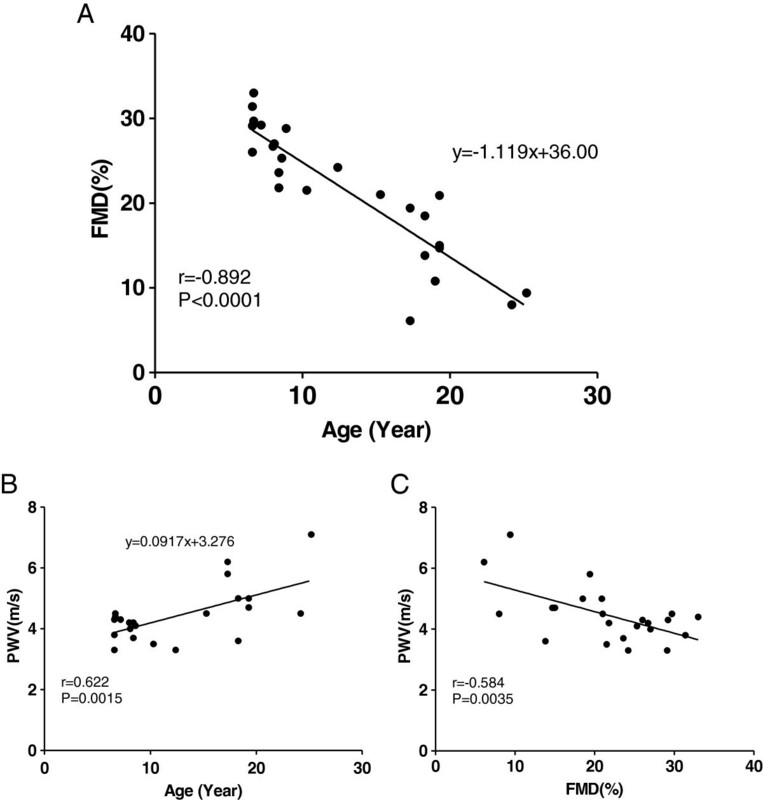 Age strongly correlates with FMD (A: r = -0.892, p < 0.0001 n = 25) and with PWV (B: r = 0.622, p < 0.002, n = 23). FMD negatively correlates with PWV (C: r = -0.584, p < 0.002, n = 23). Two monkeys were excluded from the PWV analysis: one with a poor positional signal and one that was (low) out of range. Using senescent monkeys, we examined the effect of rosiglitazone on FMD. The FMD was significantly increased following a single oral dose of rosiglitazone (21.0 ± 1.6% vs. vehicle 16.3 ± 1.6%) (Figure 3). Rosiglitazone treatment had no effect on baseline femoral artery diameter (1.52 ± 0.04 vs.1.51 ± 0.04 mm, respectively), and did not affect PWV (Additional file 3: Figure S1) when compared to vehicle treatment. In addition, when compared to vehicle treatment, this dose of rosiglitazone had no significant metabolic effects on baseline glucose, insulin, lipids, IVGTT responses, or anti-inflammatory effects, as indicated by the lack of LPS-stimulated TNFα release in these metabolically healthy primates (Additional file 4: Table S3). However, rosiglitazone treatment significantly increased EPCs (CD45-CD31 + CD34 + VEGFR2+ 7.1 ± 1.3 vs. 4.8 ± 1.1 counts/μl) and reduced EMPs (CD45- CD42a- CD54+ 26.7 ± 11.1 vs. 62.2 ± 9.8 counts/μl) (Additional file 3: Figure S2). CD45- CD42a- CD105 + EMPs (16.5 ± 3.7 vs. 33.2 ± 5.6 counts/μl, n = 5, p = 0.06) and CD45- CD42a- CD144+ EMPs (5.0 ± 1.5 vs. 41.8 ± 17.6 counts/μl, n = 5, p = 0.09) also trended lower. Acute treatment of rosiglitazone (panel A, study protocol, see Methods for details) improves FMD in NHPs (panel B). Results were adjusted by age. n = 6; **: p < 0.01. We next examined whether the deleterious effect of nicotine on FMD can be detected in NHPs. Intravenous infusion of nicotine in healthy monkeys significantly reduced FMD (8.7 ± 1.4% vs. vehicle 20.1 ± 2.2%) (Figure 4). The plasma level of nicotine, at the time of FMD measurement, was ~27 nM. Nicotine infusion (panel A, study protocol, see Methods for details) impairs FMD in NHPs (panel B). n = 3; *: p < 0.05. We established a non-invasive method for FMD to examine the effects of age on vascular function in NHPs. Our protocol to measure FMD in NHP was adapted from human protocols [1, 7, 29, 30] and as such, FMD was measured following a hyperemic response triggered by distal limb ischemia. An important aspect of the present technique was the use of a combination of anesthetics (midazolam and butorphanol or ketamine) to keep the muscle relaxed without limb movement that was not observed with ketamine alone. Measuring FMD using the articulating arm also obviates the need to manipulate the probe while measuring vascular diameter. These refinements were key in allowing us to detect a dynamic range of changes in FMD associated with age and pharmacological interventions in NHPs. Previously, total peripheral resistance was shown to fall less with acetylcholine infusion in 19.8 ± 0.6 years old monkeys than in 7.1 ± 0.4 years old monkeys , suggesting an age-related impairment of vascular dilatory response to acetylcholine. Since NHP can live as adults for decades, a better understanding of the relationship between age and FMD/PWV would be important in order to avoid the confounding effects of age. Here, we examined the age effect on the flow-induced vascular dilatory response in a colony of adult, sexually mature monkeys, 6 to 26-years of age. The robust age-FMD relationship (Figure 2A) has at least three implications. (i) The age-dependent nature of FMD recapitulates that seen in human , suggesting a translational feature of NHP model of FMD. (ii) For studies evaluating the effects of test agents on FMD in NHPs, prior randomization by age and/or recording of age at baseline is necessary, and age-dependent vs. disease-ameliorating effects on FMD may also need to be considered to clarify mechanisms of action. (iii) Prior vascular health assessment by FMD can be used to select NHPs most likely affected by test agents. This is particularly important for selecting study subjects from a heterogeneous population of NHPs. For example, monkeys develop diabetes and metabolic syndrome at varied age [16, 17], and diabetes itself features endothelial dysfunction (reduced FMD) in human . In addition, the age-FMD relationship allows us to put in perspective the effect of test agents on vascular function (FMD). It is interesting to note that the average improvement in FMD following rosiglitazone treatment (Figure 3) was equivalent to improving the monkeys’ vascular age by 5.2 years. PWV also correlates with age in NHPs (Figure 2), indicating that, similar to the FMD assessment, age effect should also be considered when evaluating PWV, by prior randomization of study groups or by age adjustment. Furthermore, age-adjustment decreases variation in FMD and PWV by 79.57% and 38.67%, respectively, among these NHPs. This suggests a stronger age impact on FMD than PWV. We established that the non-invasive methodology can be used to assess beneficial (rosiglitazone) and detrimental (nicotine) FMD changes following drug intervention in NHPs (Figures 3 and 4). Chronic treatment of diabetic patients with rosiglitazone ameliorates insulin resistance and its related metabolic disorder while improving FMD . Acute treatment also results in FMD improvement in healthy subjects in the absence of associated metabolic effects . In line with these earlier studies, we reported here that rosiglitazone improved FMD in metabolically healthy NHPs (Figure 3), without drug-related metabolic or anti-inflammatory effects (Additional file 4: Table S3). In a recent study  using NHPs of similar age to those studied here, 6-week pioglitazone treatment improves metabolic parameters, and reverses the impaired FMD that co-emerged with the metabolic syndrome. In senescent euglycemic monkeys, our results show that rosiglitazone caused an acute improvement in FMD that was independent of effects on cytokine (TNFα) release or metabolic effects on glucose and lipids. This suggests that PPARγ agonists may have a direct action on the endothelium in vivo beyond its systemic metabolic effects. Despite the lack of age-related correlation of EPCs and any of the EMPs, acute treatment with rosiglitazone decreased the number of EMP(CD45-CD42a-CD54+) and increased EPC(CD45-CD31 + CD34 + VEGFR2+) (Additional file 3: Figure S2). CD54(ICAM-1) is an intercellular adhesion molecule expressed on endothelial cells, and is associated with increased cell activation . Although somewhat controversial, EPCs are believed to play an important role in the endogenous repair mechanisms for maintaining the integrity of the endothelial monolayer [34, 35]. PPARγ is known to regulate endothelial survival and function [22, 23], as well as, EPC function [24, 25]. The rosiglitazone induced increase in FMD coincided with acute increases in EPCs and suppression of EMPs suggesting an improvement in endothelial health. While these changes in EPCs and EMPs do not provide a causal, mechanistic link for the FMD changes, from a drug discovery view point, our results could provide the impetus for further studies to evaluate the use of EPCs/EMPs as biomarkers to potentially capture a signal of vasculature change of test drugs. Cigarette smoking is associated with impairment of FMD [1, 36, 37], and treatment with nicotine gum attenuates FMD in human subjects . 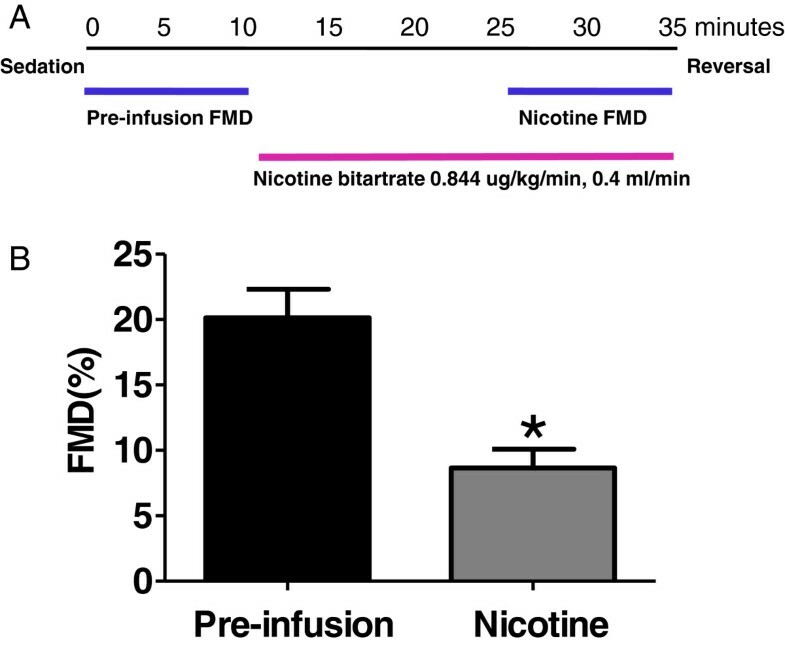 In this study, the plasma levels of infused nicotine(~27 nM), at the time of FMD measurement, matched to the levels in humans that are associated with reduced FMD , and also approximated the nicotine level (~40 nM) predicted from another human study, in which nicotine gum treatment reduces FMD . Nicotine’s effect on the cardiovascular system is complex , including release of pro-inflammatory mediators, thrombosis, decreasing oxygen supply, and increasing sympathetic nerve activity . The significant reductions in FMD with nicotine further support the translation of this model to clinical outcomes and illustrates how robust this preclinical, NHP model is in detecting changes in FMD (only 3 animals required) in a highly controlled laboratory setting. Unlike other models , the NHP is considered as a highly translational animal model of cardiovascular disease , and is often used as a preclinical model to evaluate therapeutic agents. This translation is also supported by the observed correlation between age and FMD/PWV in this study. NHPs are phylogenetically closer to humans, and may be particularly useful when a drug target does not exist in other species (for example, Cholesteryl ester transfer protein, a regulator of HDL levels, is not present in rodents). The non-invasive nature of FMD allows reuse of animals for cross-over and longitudinal studies. Further, the pharmacological effects on FMD might be detected with a relatively small group of animals (for example, 6 monkeys were used in the rosiglitazone study) under a well-controlled environment that is difficult to duplicate in clinical studies. The described FMD methodology using NHPs, might be highly valuable both for translational research, drug efficacy/safety evaluation, and for clinical dose-selection. This is particularly important for developing diabetes drugs. New guidelines of FDA require cardiovascular safety assessment before approval of any diabetes drugs . Blood flow was not assessed during these FMD determinations. FMD measured under our current protocol does not distinguish between macro- and micro-circulation effects; rather, it serves as an integrated assessment of vascular endothelium function. The variability of PWV detection under current protocol needs to be optimized, which may limit the power to detect a biological impact. Detection of EMPs and EPCs may have been limited by the availability of antibodies and the degree of cross-species reactivity of the human antibodies with monkey. As they become available, the use of additional antibodies for EMP/EPC markers and their functional characterization could provide further insight and utility in assessing vascular health. In conclusion, we established a non-invasive, clinically-relevant approach to assess vascular function in NHP by measuring FMD and PWV, and identified age as a significant modifier of FMD, and to a less degree, of PWV. Acute treatment with rosiglitazone improves FMD, while nicotine reduces FMD in senescent primates. Senescent primates with age-related endothelial dysfunction may provide a unique model for evaluating preclinically the efficacy and safety of therapeutic agents on endothelial function (i.e. FMD). The endothelial function assessment with FMD in NHPs and the associated circulating biomarkers (i.e. EPC, EMP), as described herein, may serve as a novel approach for translational research and therapeutic discovery. Like in humans, age is an important confounder that should be considered when assessing cardiovascular health and interpreting drug actions in NHPs. We appreciate Harshan Pisharath (Clinical Veterinary Science, Pfizer Inc.) for help on setting up the ultrasound-imaging based FMD measurement. We thank Jeffrey Chabot (PDM, Pfizer Inc.)for nicotine dose selection, Angela C Wolford (PDM, Pfizer Inc.) for nicotine measurement, Yanwei Zhang (DSRD, Pfizer Inc.), Dingzhou Li (Reg Strategy & Compliance, Pfizer Inc.) for statistical help. The authors declare that they have no competing interests. DRK’s current address is National Institutes of Health, Department of Health and Human Services. The opinions expressed in this article are the authors’ own and do not reflect the view of the National Institutes of Health, the Department of Health and Human Services, or the United States government. DRK designed and supervised the study while employed at Pfizer, Inc., and RLS and AHS performed the in vivo study. MW designed the nicotine study and the cytokine study. DAB and MW assisted with the in vivo study setup and sample processing. SAS and CH designed the EMP and EPC analysis, CH measured the EMPs and EPCs, and SAS analyzed and interpreted the EMP and EPC data. DRK, AHS, and MW analyzed and interpreted the in vivo and in vitro data. MW wrote the manuscript. All authors have read and approved the manuscript for publication.